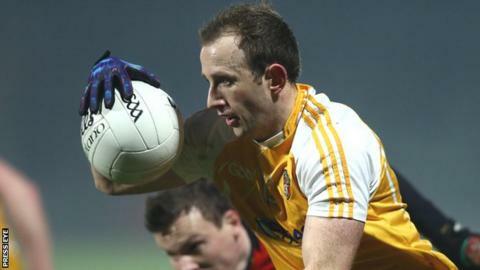 Antrim completed a disappointing Division Four campaign with a 0-10 to 0-6 defeat to a Clare side which secured promotion. Clare had a stiff breeze at their backs at Creggan and they fired over the opening four points. Antrim fought back to go in 0-4 to 0-2 behind at the break and Saffrons defender Kevin O'Boyle was black carded early in the second half. Clare stayed in front and won with ease to secure a place in Division Three. Antrim forward Michael Pollock was among the Antrim scorers in a game which left Liam Bradley's side with just two wins from their seven league fixtures. Antrim: R Hanna, K O'Boyle, R Johnston, O'Hamill, D Lynch, M Johnston, J Laverty, M McCann, S McVeigh, R Murray, M Sweeney, T McCann, CJ McCourty, B Neeson, M Pollock.